Our Plumbers are qualified and trained to provide installation and maintenance of Thermostatic mixing valves (TMV), they have their working with children and police checks as required to work in hospitals, nursing homes, child care centres and the like. 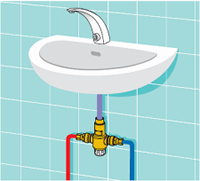 Q: What is a Thermostatic mixing valve? Thermostatic mixing valve is a device that mixes hot and cold water to deliver warm water at a safe and predetermined temperature. Q: Where are they installed? They are installed in outlets such as baths, basins, showers and sinks. Q: Why are they installed in the hot water system? They are installed to stop scalding from hot water. Third degree burns from hot water can occur in 1 second at 70deg C.
Q: Who needs them installed? Hospitals, nursing homes, child care centres and the like. Q: Why do they have to be installed? As per Victorian Government regulations and as your duty of care. Q: How often do they have to be serviced? Monthly temperature checks and a full service every 12 months. The thermostatic element to be replaced at least every 5 years. Q: What paper work or records are required for the valves? A record or log book is required to be kept with the servicing and test results. 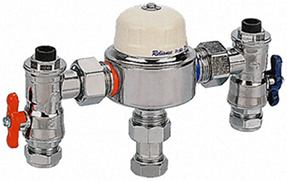 Q: Who can help you with the supply, installation and service of your thermostatic mixing valves?